This page is a work in progress. Click on an image for a full sized view. Large files. Please be patient. 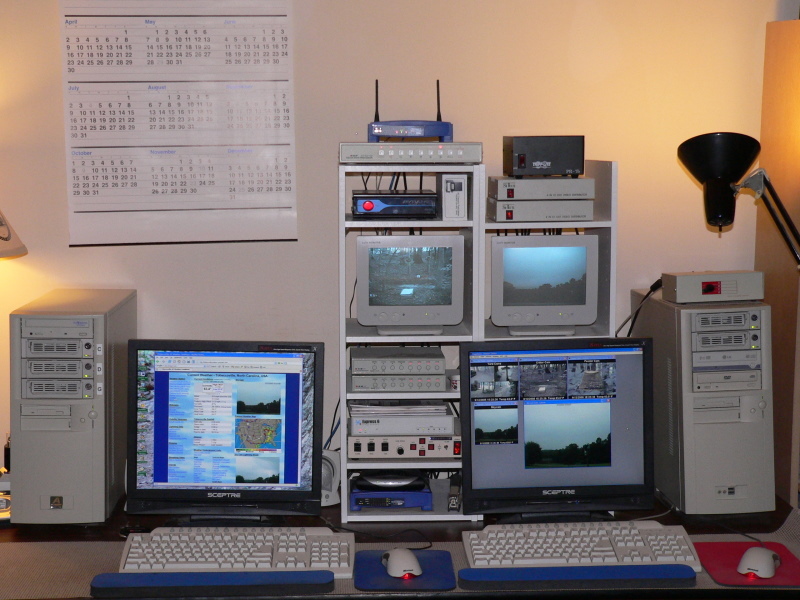 Ambient Virtual Weather Station, Image Salsa and Lightning/2000 software. Center: Davis Vantage Pro2 console. 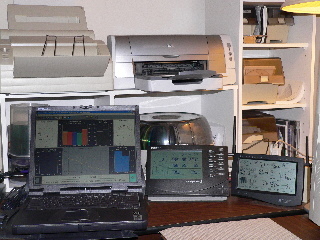 Right: Oregon Scientific WMR968 console. 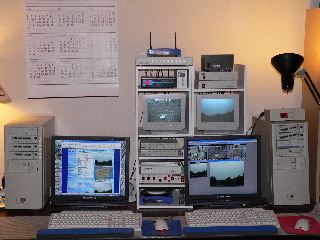 The weather station and video equipment are powered by a Trace UPS system. The UPS will run the weather station and several other pieces of essential equipment for 24 hours without external power. The Sky Cam is visible in the background. The Sky Cam is an Axis 211 network camera with a 6-60mm motorized zoom lens. The camera is enclosed in an outdoor housing which is mounted on a motorized pan/tilt unit. The housing has window heat and fan cooling. 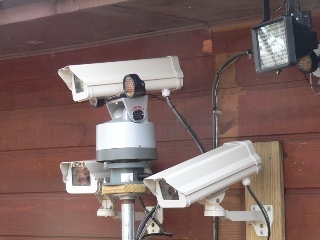 The camera connects to the network via a CAT 5 cable. The Axis 211 has "Slow Shutter" with exposures as long as 2 seconds. Low light performance is excellent. Moving objects are blurred at slow shutter speeds but this isn't a problem for sky observations. There are some minor imager defects visible in full low light mode. 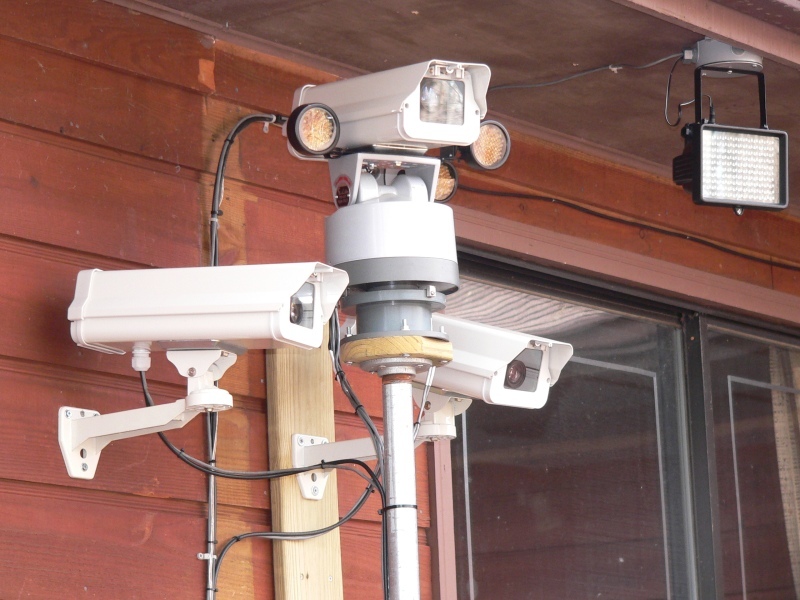 More information about the Axis 211 network camera can be found here. 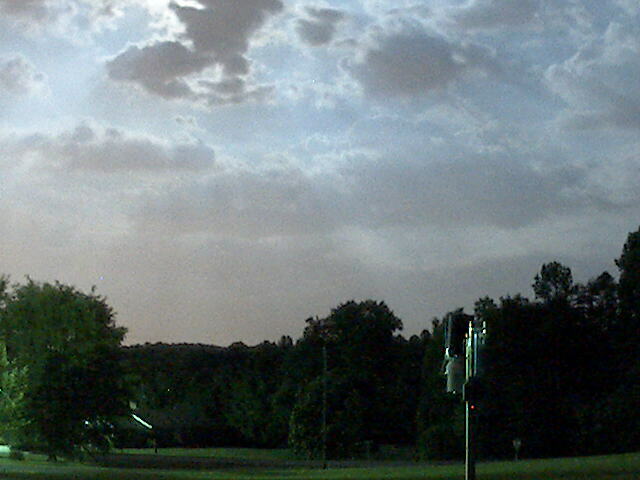 Below is an image of the moonlit sky captured by the Sky Cam. 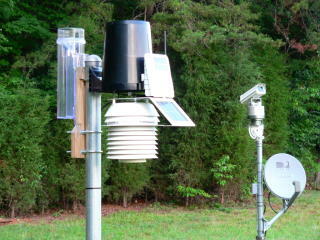 The weather station in the foreground and the trees are illuminated by a couple of street lights in the neighborhood. Most nights the sky is filled with an orange glow from the street lights in Winston-Salem reflecting off haze in the atmosphere. On clear nights brighter stars are visible. 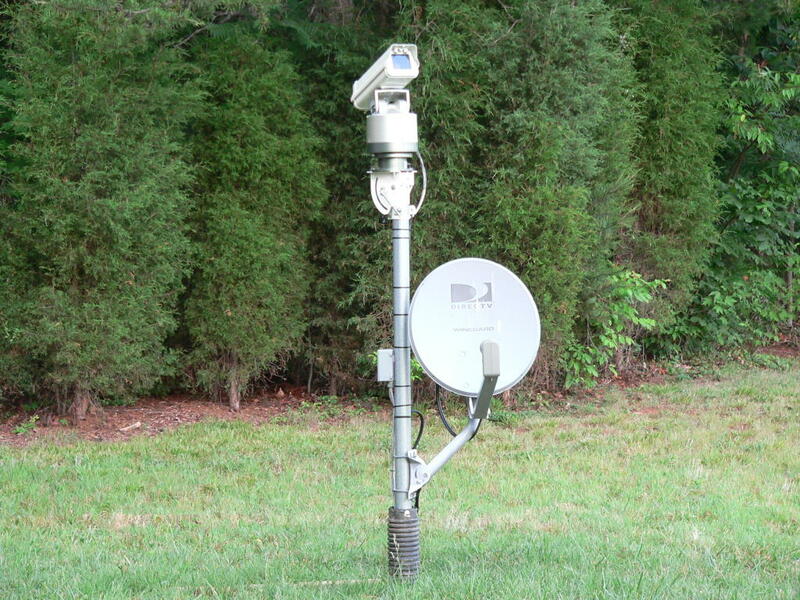 The Boltek antennas are located inside homemade PVC enclosures made from parts obtained at a local home improvement center. 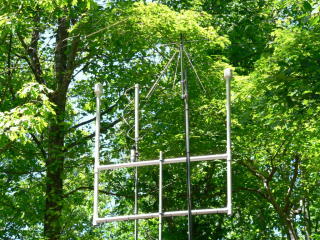 The antenna assembly is mounted on top of two 10' sections of antenna mast. 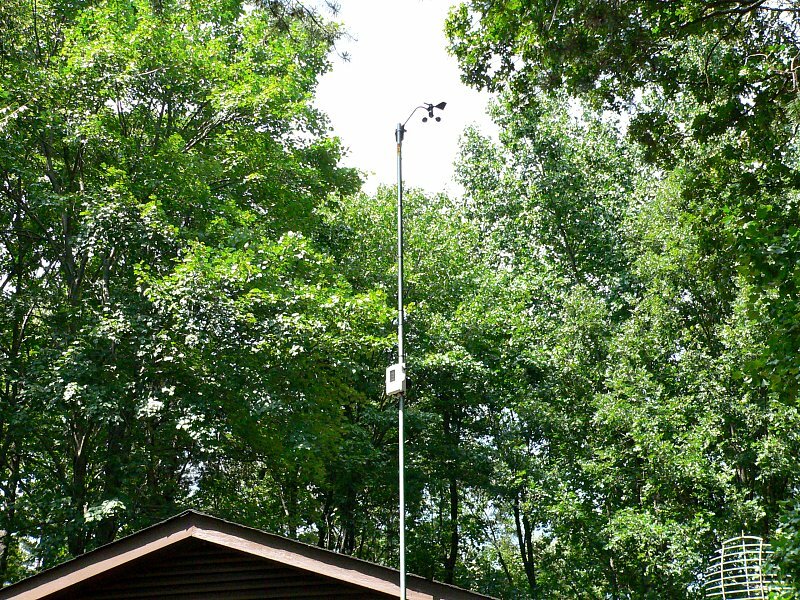 The mast is attached to the house using a pair of heavy duty wall mounts and lag bolts. 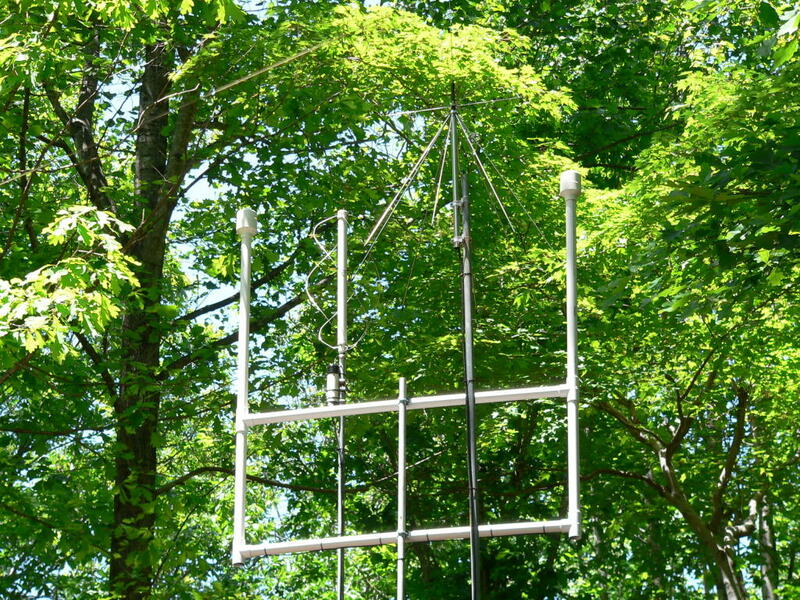 The antennas are approximately 30' above the ground. 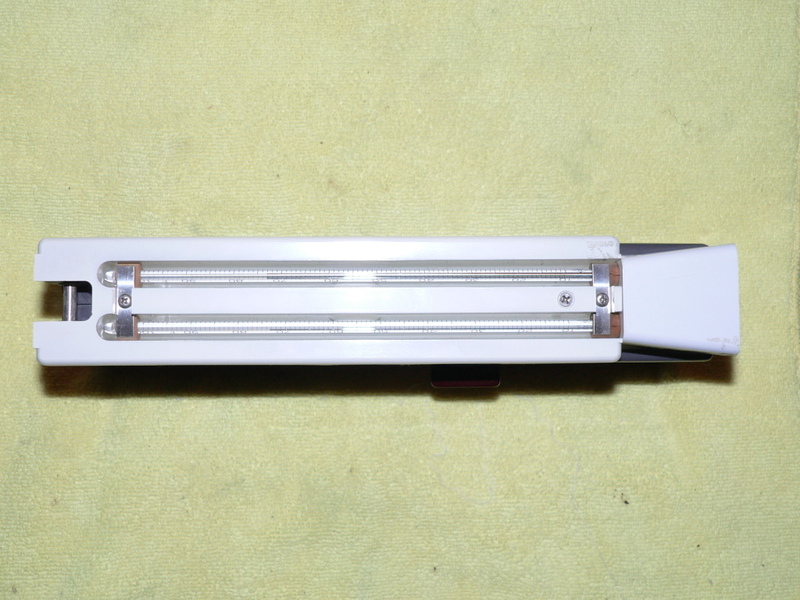 View of Boltek antenna inside PVC housing. 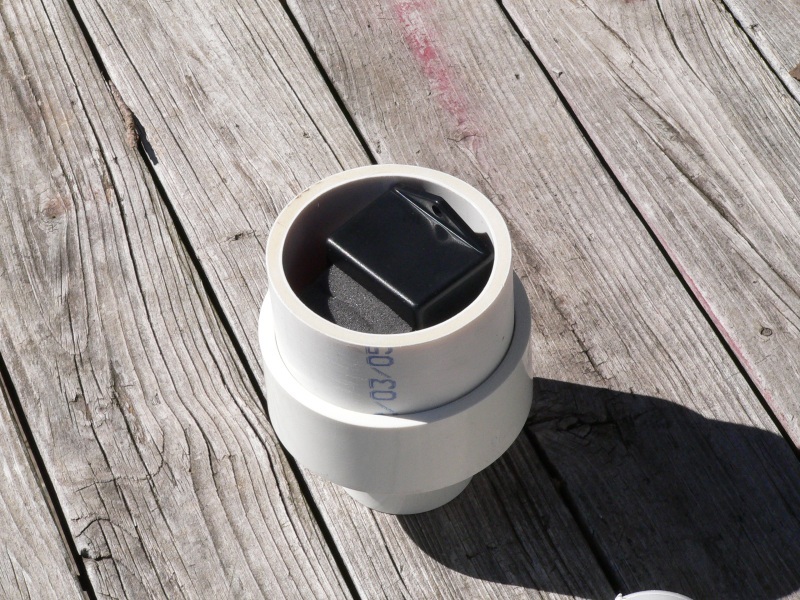 The PVC housing consists of a 3" to 1 1/2" reducer, a 3" long piece of 3" PVC pipe and a 3" PVC pipe cap. The 3" pipe is glued into the reducer. 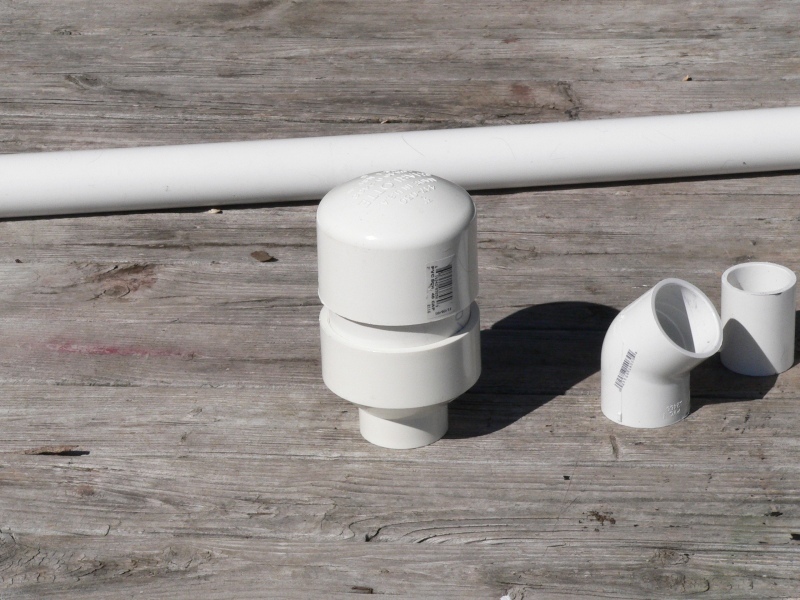 The pipe cap is slipped on top of the assembly after applying some Teflon grease to the inside of the cap and on the outside of the mating PVC pipe. DO NOT glue the cap on to the assembly. This is a view of the antenna assembly with the pipe cap partially installed. 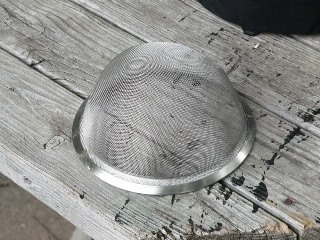 Bottom view of fine mesh kitchen strainer with handle removed. The strainer is made of tough stainless steel. 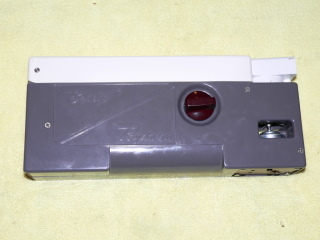 A grinder or Dremel tool with a cutoff wheel is required to remove the handle. 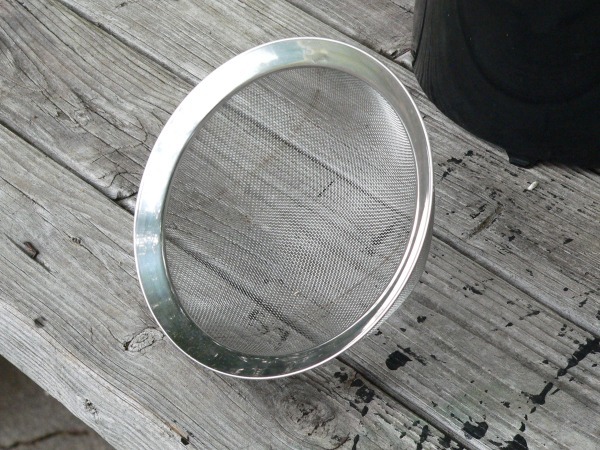 The strainer was purchased at a local Walmart. I like the rim design. The angle on the rim should reduce the number of raindrops that splash out of the collector compared to a flat rim. The collector hasn't stopped up since installing the screen but it is still necessary to clean the funnel and tipping buckets occasionally. 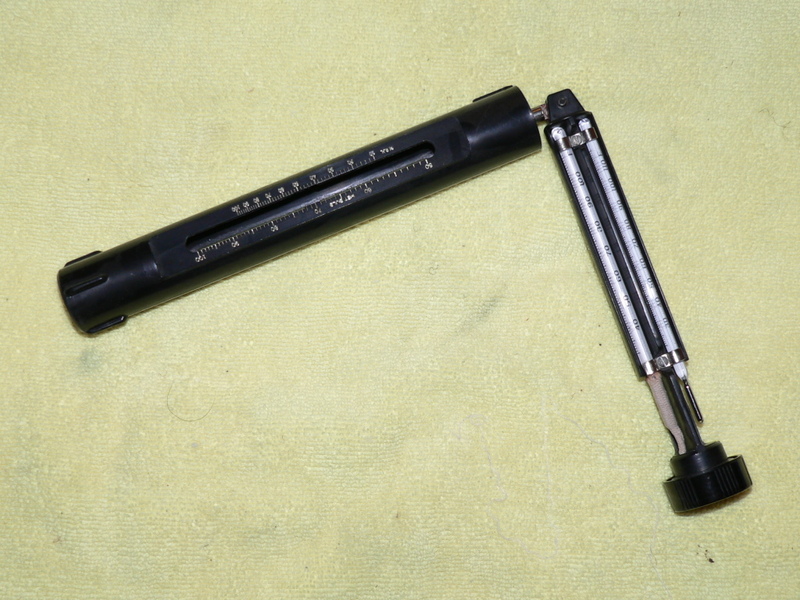 A psychrometer is used to measure the "Dry Bulb" and "Wet Bulb" temperatures of air. Humidity, dew point and several other air characteristics can be derived from these temperatures. The psychrometer is a matched pair of precision thermometers. One of the thermometers has a cloth sock or wick covering the bulb. 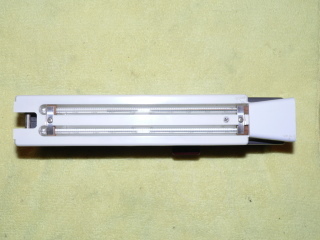 This is the "Wet Bulb" thermometer. The other thermometer is the "Dry Bulb" thermometer. 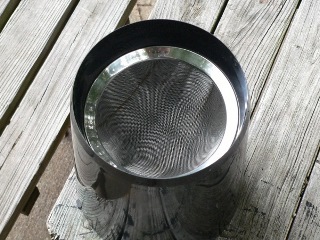 The sock is saturated with distilled water before use. 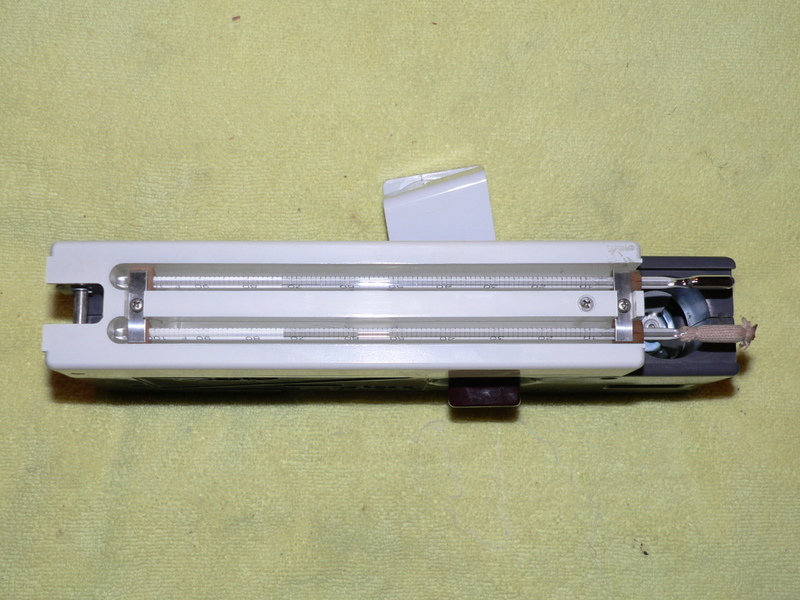 Air is passed over the thermometer bulbs either by manually slinging the thermometer assembly through the air or by pulling air over the bulbs with a fan. Water evaporates and cools the thermometer bulb as air passes over the wetted sock. After a few minutes the temperature stabilizes. This is the "Wet Bulb" temperature. The "Wet Bulb" and "Dry Bulb" temperatures are recorded. 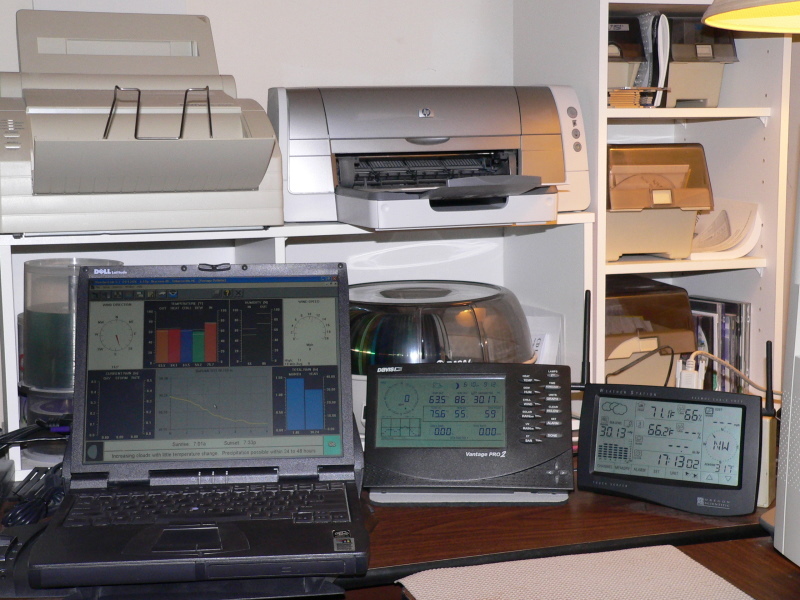 Once the temperatures are known a psychrometric chart or calculator can be used to determine humidity, dew point, etc. Notice the cloth wick on the wet bulb thermometer. Water is applied to the wick before use. technique to get consistent readings.